World Para Swimming European Championships 2018 - Dublin. As an official World Para Swimming partner, Swans were proud supporters of the 2018 World Para Swimming European Championships held at the National Aquatic Centre, Dublin. During the championships visually impaired athletes from across Europe were introduced to the Swans Blackened Goggles and they offered feedback and invaluable insights into this truly unique range of goggle that Swans have developed specifically for VI swimmers. Uptake of the Blackened goggles was instant, and far beyond expectations. 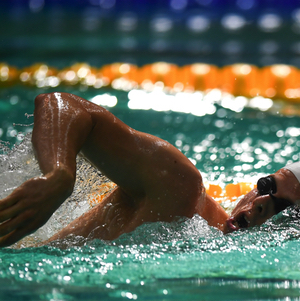 Over 60% of swimmers in sampled* event finals events were choosing to use Swans Blackened goggles. Also extremely popular at the event, the Swans range of FINA approved prescription goggles, with many of Europe's Para swimmers now choosing to use the Swans SRX and FO2 prescription models for training and competition use. Standout performances from the week were without question those of Swans Ambassador, Hannah Russell who claimed 3 golds, and European titles from 3 events. The first of the week came in the S12 50 freestyle in which Russell touched home in a time of 27.94, a dead heat with Germany's Krawzow. In the following days Hannah took gold in the S12 100 back and S12 100 freestyle.